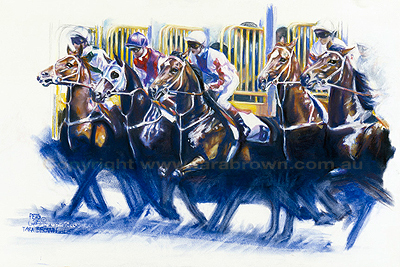 A finalist in the Inglis Equine Art Prize 2012. Early one morning, I stumbled upon the most amazing eerie scene at the Hawkesbury racetrack, NSW, Australia. A trainer, his thoroughbred charge and the track rider (jockey) discussing the intricate details of the ride. A backdrop of fog made a wall of pale blue. The water droplets were thick in the air which gave an appearance as if a sheet of fog hung from the sky. The black of the light-less morning rose above the floodlight. Early morning at the racetrack. This was a magic moment. 110 x 95 (approx) framed. 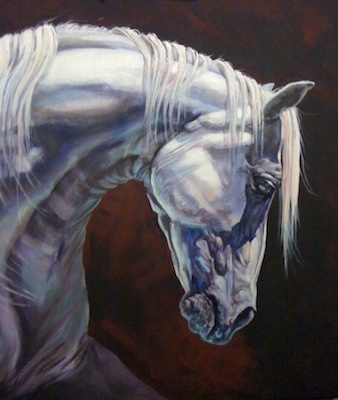 Expressing the regal beauty of a classical horse. An Arabian mare waiting for her master to come back home from his journey. 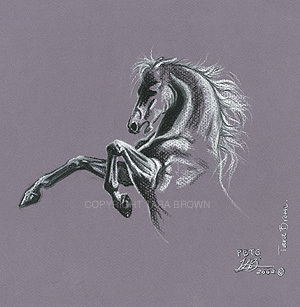 The Arabian horse is known for their loyalty and close relationship bond to their master. Her yearning, reflects this. The light from the desert sands and the blue from the brilliant desert sky is seen clearly in the use of reflective light on her body. The authentic Arabian tent. A breeze blows, while she waits, but her focus is on her master and does not waiver, despite the movement of the tassels. 16" x 20" stretched canvas. 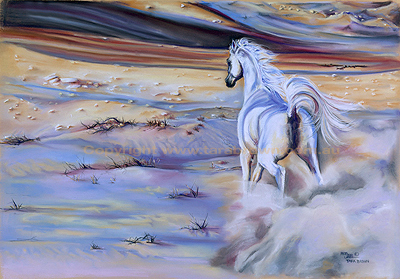 A feminine mare with her Saluki companions, protected by the walls of sand in the desert. To view your purchases, please click on the 'View Cart' button. 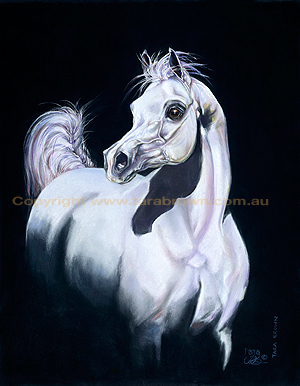 Proudly owned by Bremervale Arabians, Australia. 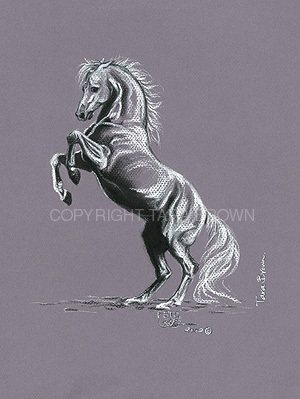 Original Study, in pastel, of rearing horse. 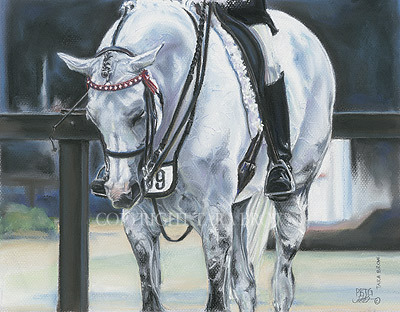 This original pastel pair are now in a private collection in QLD, Australia. 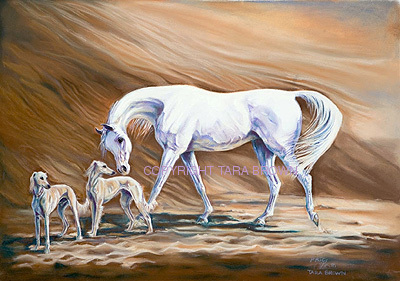 Tara painted this painting with Italian stonework sculptures in mind ... and the idea of sandstorms in the desert. A new path she plans to explore with her paintings. This painting shows a freedom of expression and movement, lost and found lines and space for your imagination to run free. 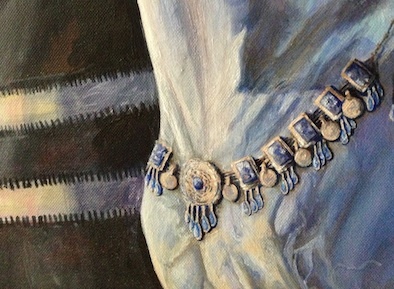 Proudly hangs in a private collection in England. 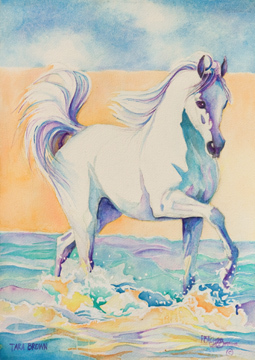 Tara painted 'Inspiring Imagination' as an exercise to 'free up'. 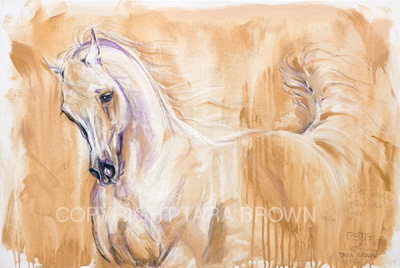 'Modern Work' has plenty of gold with free brush strokes and horses emerging from this freedom. 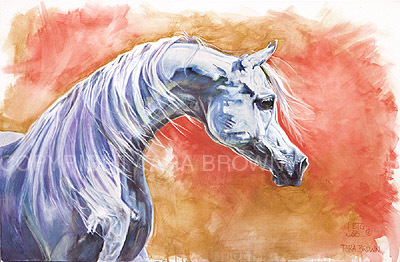 Light and movement are of utmost importance in Tara's work and here in 'Earth, Wind & Fire' you can see and almost feel the breeze through the mane, as the light exposes the beauty of this Arabian horse's being. 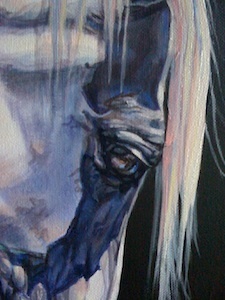 The Original mixed media painting resides in a private collection in Kuwait. 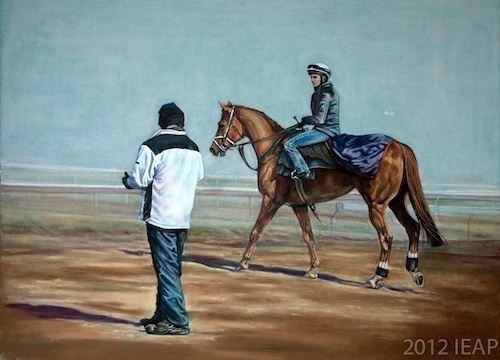 This painting captures a moment of rest for this beautiful horse, waiting for the Championship workout. 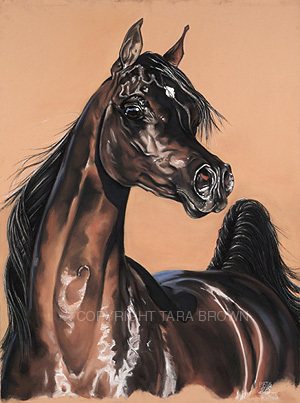 'Time-Out' has won multiple Equine Art Awards, in international company. A deposit of $500 is required with the balance payable by bank cheque, within 30 days. Please email Tara your contact details immediately following your deposit. Thank you. for the cover of their 2008 Calendar. 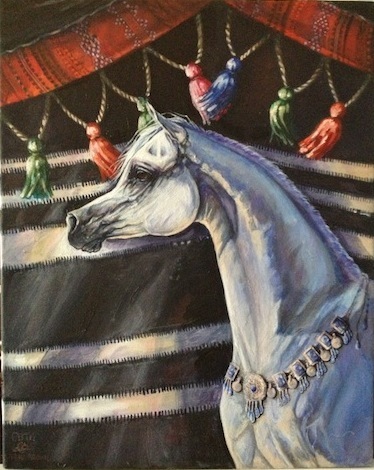 Tara donated this painting to the QLD flood appeal 2011 for auction. It now belongs to a private collector in England. Plus $400 Packaging and Freight. Inspired by the power and speed of racing. Tara wanted to capture the horses impatiently stomping inside the barriers, waiting for the gates to open so they could fly. You see them as they start. 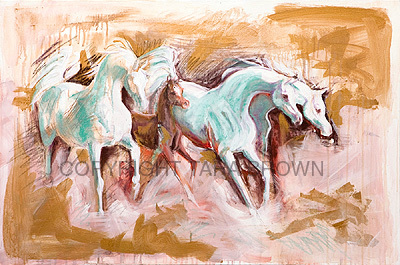 Each horse's uniqueness is evident, yet their mission the same. The intense power of a stallion.